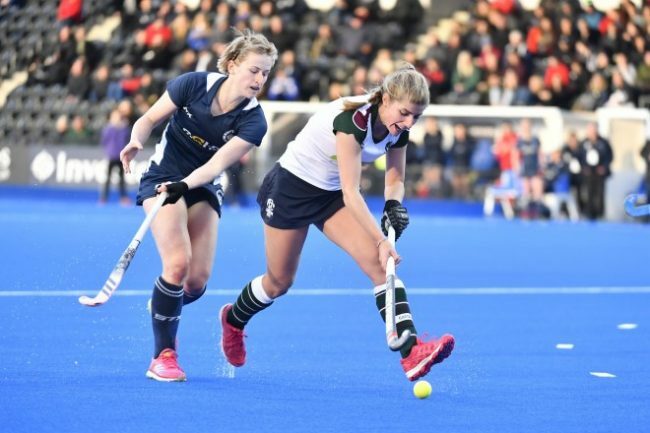 Surbiton were first to secure their place in Sunday’s final after defeating East Grinstead 2-1 before Hampstead & Westminster went on to beat Beeston by the same scoreline. Holcombe secured their place in a third consecutive final with a crushing 6-0 victory over Buckingham whilst Surbiton kept their chances of a sixth straight title alive by defeating East Grinstead 4-1. An important Sabbie Heesh save followed, denying Bray from adding another, before Surbiton got back on the offense and notched a quick double as both notched their second goals. The University of Exeter led 2-0 at half-time thanks to goals from Dan Jackson and James Thomas before James Carson added to the total from a penalty corner and Thomas secured his brace shortly after the restart to go four goals ahead. Havant scored two goals in quick succession late on through Michael Deller-Merricks and Atiq Arshad but it would prove to only be a consolation. Old Georgians then clinically defeated Bowdon 6-3 with Sam Ward hitting a first-half brace alongside Nick Burns and Matthew Ming for a 4-1 half-time lead. Bowdon’s Ben White twice found the net to put his side within touching distance but hopes of a comeback were ended as Ward secured his hattrick before Nick Cooper added another immediately after. Going into Sunday’s all-important final round of matches, Old Georgians lead the way on six points with both the University of Exeter and Havant sat on three, whilst Bowdon are the only yet to pick up a point. Slough began Saturday’s Investec Women’s Play-Off Round Two action with a 5-1 victory over Stourport whilst Hampstead & Westminster overcame the University of Loughborough 1-0 in a tough match.